In	the	early	years of	the	Swim,	swimmers	often	emerged	from	the	water	with	oil	and	tar	balls	on	their	skin	and	swimsuits. In recent years, swimmers	reported	seeing	schools	of	menhaden	beneath	them	as	they	swam. 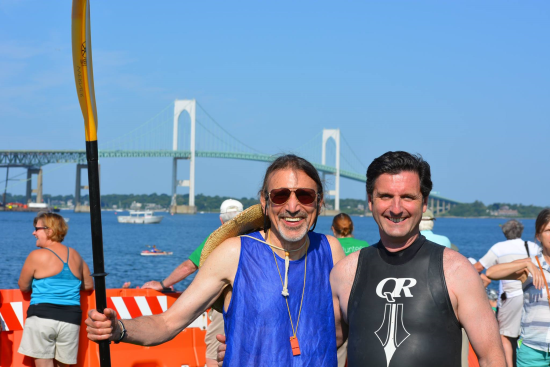 One	of	the	most	storied	open-water swims	in	the	United	States,	the	Save	The	Bay	Swim	celebrates	tremendous	progress	in	cleaning	up Narragansett	Bay	since	its	first	official	Swim	in	1977	and	the	organization’s	founding	in	1970. About	500	swimmers	and	nearly	200 kayakers	between	the	ages	of	15	and	83+	annually	participate	in the	1.7-nautical-mile	journey	from	Naval Station	Newport across	the	East	Passage to	Jamestown’s	Potter	Cove.